Ensani, F., Omranipour, R., Jahanzad, I., Jafari, A., Nafarzadeh, S., Aminishakib, P. (2017). The Core Needle and Surgical Biopsy Concordance to Detect Estrogen, Progesterone, and Her-2 Receptors in Breast Cancer: A Comparative Study. 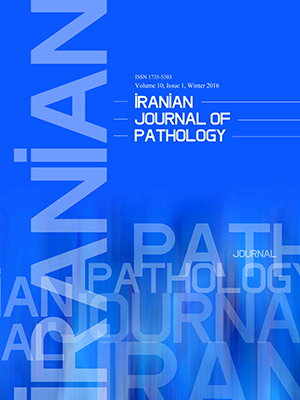 Iranian Journal of Pathology, 12(3), 202-208. Fereshteh Ensani; Ramesh Omranipour; Isa Jahanzad; Azadeh Jafari; Shima Nafarzadeh; Pouyan Aminishakib. "The Core Needle and Surgical Biopsy Concordance to Detect Estrogen, Progesterone, and Her-2 Receptors in Breast Cancer: A Comparative Study". Iranian Journal of Pathology, 12, 3, 2017, 202-208. Ensani, F., Omranipour, R., Jahanzad, I., Jafari, A., Nafarzadeh, S., Aminishakib, P. (2017). 'The Core Needle and Surgical Biopsy Concordance to Detect Estrogen, Progesterone, and Her-2 Receptors in Breast Cancer: A Comparative Study', Iranian Journal of Pathology, 12(3), pp. 202-208. Ensani, F., Omranipour, R., Jahanzad, I., Jafari, A., Nafarzadeh, S., Aminishakib, P. The Core Needle and Surgical Biopsy Concordance to Detect Estrogen, Progesterone, and Her-2 Receptors in Breast Cancer: A Comparative Study. Iranian Journal of Pathology, 2017; 12(3): 202-208. Background &Objectives: Evaluation of estrogen receptor (ER), progesterone receptor (PR), and (human epidermal growth factor receptor-2) Her-2 on core needle biopsies (CNBs) is increasingly in use to diagnosis early breast cancer, but its concordance with surgical excision (SE) is not well documented. Methods: The study included 100 formalin fixed, paraffin-embedded specimens of invasive breast carcinoma archived in Pathology Department of Cancer Institute, Tehran, Iran, from 2011 to 2014. Immunohistochemistry was applied to detect ER, PR, and Her-2. Results: The current study findings indicated a significant correlation of 90% between CNB and SE specimens for ER expression. The correlation between CNB and SE specimens was estimated as 81% and 97.3% for PR and Her-2, respectively. Discussion: CNB can be performed confidently to determine ER and Her-2. For PR, results obtained from CNB should be considered. 1. Tamaki K, Sasano H, Ishida T, Miyashita M, Takeda M, Amari M,et al. Comparison of core needle biopsy (CNB) and surgical specimens for accurate preoperative evaluation of ER, PgR and HER2 status of breast cancer patients. Cancer sci. 2010 1;101(9):2074-9. 2. Arnedos M, Nerurkar A, Osin P, A'hern R, Smith IE, Dowsett M. Discordance between core needle biopsy (CNB) and excisional biopsy (EB) for estrogen receptor (ER), progesterone receptor (PgR) and HER2 status in early breast cancer (EBC). Ann Oncol. 2009 1;20(12):1948-52. 3. Sutela A, Vanninen R, Sudah M, Berg M, Kiviniemi V, Rummukainen J,et al. Surgical specimen can be replaced by core samples in assessment of ER, PR and HER-2 for invasive breast cancer. ActaOncologica. 2008 1;47(1):38-46. 4.Ma Soomi T,Shfaruddin, Kamali M, HasaniMehraban A, Omranipur R. Psychological responses to breast cancer:A qualitative study. J SABZEVAR Univ Med Sci. 2013 20; 1(67): 84-92. 5.Journal article on the Internet: Pusztai L, Viale G, Kelly CM, Hudis CA. Estrogen and HER-2 receptor discordance between primary breast cancer and metastasis. Oncologist. 2010, doi: 10.1634/theoncologist.2010-005915(11):1164-8. 6.Usami S, Moriya T, Amari M, Suzuki A, Ishida T, Sasano H. Reliability of prognostic factors in breast carcinoma determined by core needle biopsy. Japanese JClinOncol. 2007 1;37(4):250-5. 7. Omranipour R, Alipour S, Hadji M, Fereidooni F, Jahanzad I, Bagheri K. Accuracy of estrogen and progesterone receptor assessment in core needle biopsy specimens of breast cancer.Iran Red Crescent Med J. 2013;15(6):515. 8.D'Alfonso T, Liu YF, Monni S, Rosen PP, Shin SJ. Accurately assessing her-2/neu status in needle core biopsies of breast cancer patients in the era of neoadjuvant therapy: emerging questions and considerations addressed. Am J SurgPathol. 2010 1;34(4):575-81. 9. Al Sarakbi W, SalhabM, Thomas V, Mokbel K.Is preoperative core biopsy accurate in determining the hormone receptor status in women with invasive breast cancer? in International seminars in surgical oncology. 2005. BioMed Central Ltd.
10.Reisenbichler ES, Lester SC, Richardson AL, Dillon DA, Ly A, Brock JE. Interobserver Concordance in Implementing the 2010 ASCO/CAP Recommendations for Reporting ER in Breast Carcinomas. Am JClinPathol. 2013 1;140(4):487-94. 11.Cserni G, Francz M, Kálmán E, Kelemen G, Komjáthy DC, Kovács I, et al. Estrogen receptor negative and progesterone receptor positive breast carcinomas—How frequent are they?. PatholOncol. 2011 1;17(3):663-8. 12.Prati R, Apple SK, He J, Gornbein JA, Chang HR. Histopathologic Characteristics Predicting HER‐2/neu Amplification in Breast Cancer.Breast J. 2005 1;11(6):433-9. 13.Tsuda H, Kurosumi M, Umemura S, Yamamoto S, Kobayashi T, Osamura RY. HER2 testing on core needle biopsy specimens from primary breast cancers: interobserver reproducibility and concordance with surgically resected specimens. BMC cancer. 2010 7;10(1):1. 14. Li S, Yang X, Zhang Y, Fan L, Zhang F, Chen L. et al. Assessment accuracy of core needle biopsy for hormone receptors in breast cancer: a meta-analysis. Breast Cancers Treat. 2012 1;135(2):325-34. 15.Pettine S, Place R, Babu S, Williard W, Kim D, Carter P. Stereotactic breast biopsy is accurate, minimally invasive, and cost effective. AmJ J Surg. 1996 31;171(5):474-6. 16.Pijnappel RM, van Dalen A, Rinkes IH, van den Tweel JG, Willem PT. The diagnostic accuracy of core biopsy in palpable and non-palpable breast lesions. Europ J Radiol. 1997 28;24(2):120-3. 17.Chen X, Yuan Y, Gu Z, Shen K. Accuracy of estrogen receptor, progesterone receptor, and HER2 status between core needle and open excision biopsy in breast cancer: a meta-analysis. Breast Canc Res Treat. 2012 1;134(3):957-67. 18. Zidan A, Brown JC, Peston D, Shousha S. Oestrogen and progesterone receptor assessment in core biopsy specimens of breast carcinoma. J ClinPathol. 1997 1;50(1):27-9. 19. Bilous M. Breast core needle biopsy: issues and controversies. Mod Pathol. 2010 1;23:36-45. 20.Nadji M, Gomez-Fernandez C, Ganjei-Azar P, Morales AR. Immunohistochemistry of estrogen and progesterone receptors reconsidered. Am J ClinPathol. 2005 1;123(1):21-7. 21. Khoury T, Zakharia Y, Tan W, Kulkarni S, Liu W, Zhang S,et al. Breast hormonal receptors test should be repeated on excisional biopsy after negative core needle biopsy. Breast J. 2011 1;17(2):180-6. 22.Brenner RJ, Fajardo L, Fisher PR, Dershaw DD, Evans WP, Bassett L,et al. Percutaneous core biopsy of the breast: effect of operator experience and number of samples on diagnostic accuracy. Am J Roentgenol. 1996;166(2):341-6.